I’m bringing a bright red white & blue bundt cake to #SundaySupper this week! 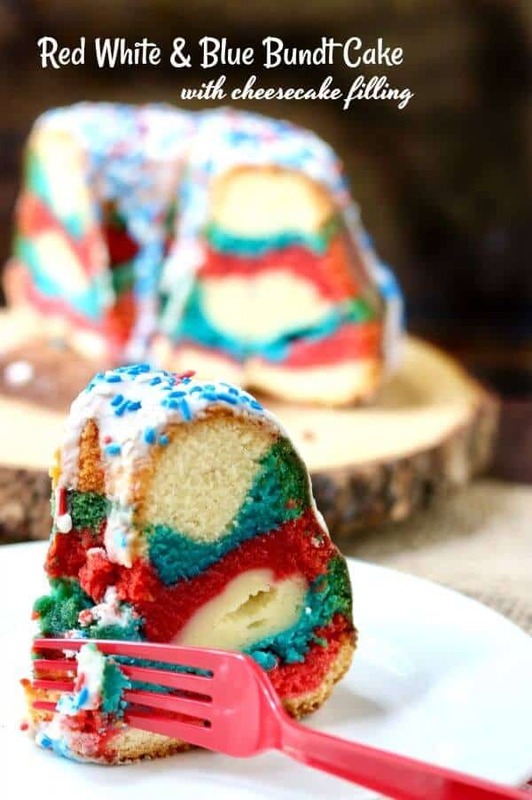 Perfect for all the summer holidays, this red white & blue cake is tangy, sweet, and delicious with a tunnel of cheesecake filling running right through the center. 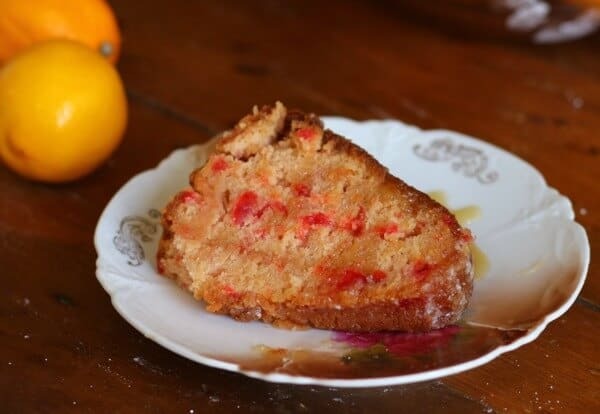 The tangy berry flavor and bright colors are due to the same secret ingredient that makes this cake as easy to make as it is fun to eat. Be sure to check out all the great red, white, and blue recipes in the links at the bottom of this post! What’s a summer party without red white and blue recipes? This cake is pretty, there’s no doubt about it. You slice into it and the red and blue colors are bright and clear. You don’t realize how really unique it is, though, until you take that first, tangy bite. My kids love this cake because it’s not your basic vanilla cake. The Koolaid brings a tangy Sweet Tart sort of flavor to it while the creamy cheesecake filling mellows it out so that it doesn’t make your cheeks collapse into the center of your mouth like you’d bitten a green persimmon. This is the cake to make for those people who are always complaining things are “too sweet”. Not something you hear in the south too often, by the way. We like our desserts tooth-achingly sweet and syrupy for the most part. I wanted to make a red white & blue bundt cake but I didn’t want to deal with the food coloring flavor that happens so often. Let’s face it, even the no-flavor food colorings have flavor if you use enough to get good color in a cake. I’d used Koolaid to flavor my Strawberry pound cake a few years ago and I wondered if I could make a more patriotic, less pink version for the Summer holidays. It took a couple of tries and I thought I was going to have to cancel my entry into #SundaySupper. Let me back up a little. This week we had a ton of doctor appointments. Sean had his final check on the surgery site and got his stitches out. Nick got his yellow fever and typhoid immunizations in preparation for his missions trip to Panama in July. I had a referral appointment with a specialist for my thyroid levels because they’ve all of a sudden decided to be uncontrollable – low not high. So I’ve been pushing myself for far too long. I normally put about 150 miles a month on my car (keep in mind I work at home) and this week alone I racked up 200 miles. Every morning when I got up I said… “I have to figure out a time to get work done today.” and every night when I went to bed I had barely managed to handle my personal stuff. So Thursday afternoon I threw together a red white & blue bundt cake and … when I slipped it out of the pan…. I made it again Friday and changed up some things hoping to get it right. It came out fine but it was late by the time I got to take pictures so they were terrible. I felt like I was running a marathon barefoot and kept stubbing my toe on rocks. So Saturday morning I woke up with the plan to take pictures in a desperate attempt to get this red white & blue bundt cake on the blog. It was dark, and stormy, and raining cats and dogs. Prayer works, y’all. The sun came out just long enough for me to get some halfway good images and here I am. Now, you’re not going to have those problems because this cake really IS easy to put together. I was hurrying and I messed up a couple of steps the first time. The main thing is to wait for the cake to be completely cool before you take it out of the pan. The cream cheese needs a chance to firm up or your gorgeous red white & blue bundt cake is going to collapse. Add Pop-Rocks to the top for fireworks in every bite! Melt 1/2 cup white chocolate with 2 tablespoons heavy cream and stir until smooth. It’s a delicious glaze. Top with cherry or blueberry pie filling – or a little of each. Leave out the cream cheese filling. After the cake has cooled cut the top third off carefully. 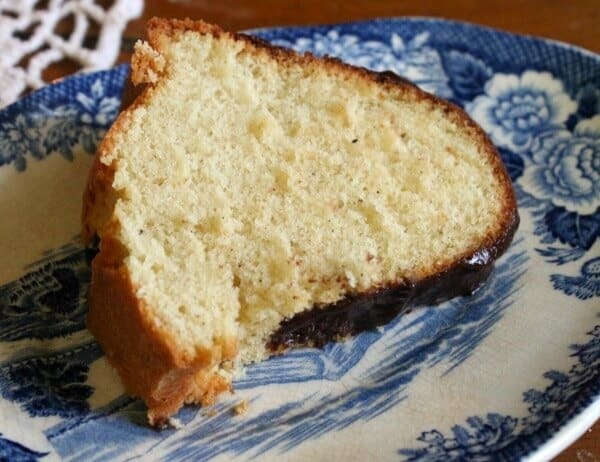 Scoop out some of the cake on the inside of the bottom third and gently press softened vanilla ice cream into the hollow. Put the top of the cake back on and add the glaze. Freeze until ready to serve. 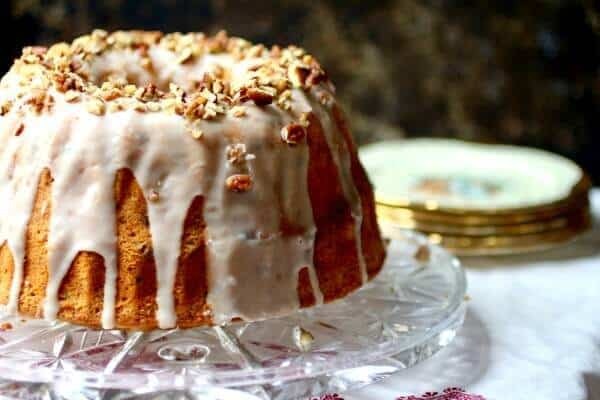 A good, heavy bundt pan is essential for recipes like this! I love NordicWare because the pans are heavy and hold up forever. This bundt pan is a gorgeous lotus shape that would be perfect for this (or any other!) bundt cake! I think pop rocks would be a fun addition to the the top of this cake. Every bite would fizz and sizzle! 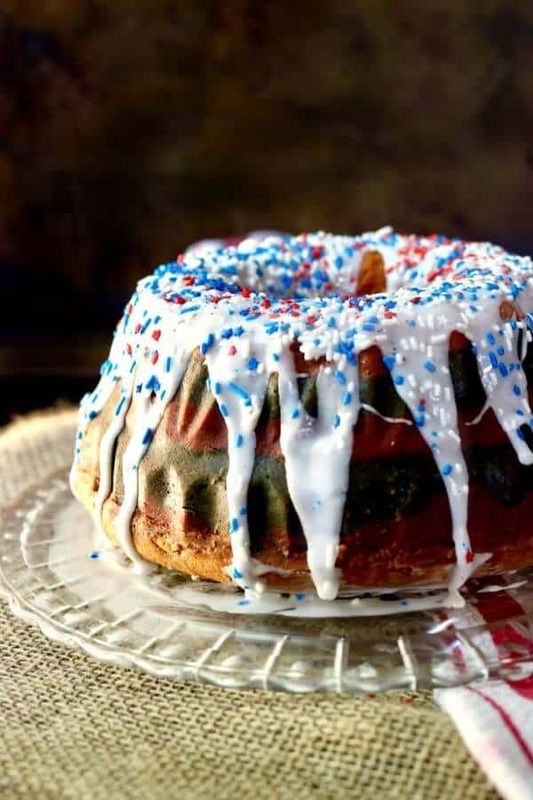 Let’s face it, brightly colored food, like this red white & blue bundt cake, is fun. When it’s this easy, unique, and delicious it’s one of those recipes you want to hang on to for a long time. Enjoy this easy 4th of July dessert – so pretty they’ll always remember! Tangy bundt cake in red, white, and blue with a sweet, rich cheesecake filling. Perfect for the summer holidays! 1 packet cherry Kool Aid, , the kind you add sugar to. Add the vanilla, and the sour cream and blend. Add the blue Kool Aid to one bowl - stir until smooth. Add the red Kool Aid to one bowl - stir until smooth. Add a few drops of food coloring if needed to brighten the color. Blend filling ingredients together until smooth. Add a layer of white batter to the bundt pan. Top with a layer of red batter. Smooth a layer of blue batter on top. Add the filling in a strip, keeping it in away from the edges (both outside and center) of the pan. Top with the remaining cake batter starting with red and then adding blue, then white. Allow to cool completely in the pan. Whisk powdered sugar, cream, and vanilla in small bowl until smooth. Add a little more cream if needed. Using spoon, drizzle glaze over cake in zigzag pattern. Sprinkle red, white, and blue sprinkles over the top. Let cake stand at room temperature until glaze sets- 10 minutes or so. This would look great on any 4th of July table! This is such a fun cake and I bet the Kool Aid adds great flavor. It’s kinda tangy… but my kids loved it. Great idea using koolaid to color the cake. Sorry about all the trials and tribulations , such is the life of a food blogger. Oh yeah. After 10 years I’m used to it… but it was a wild ride. OOOOHhhh breakfast! I like how you think. My husband would love this. What a fun dessert! How festive and fun! I love the poprocks on top. I haven’t had those in forever! Right? Cracker Barrel has them and so does Amazon. 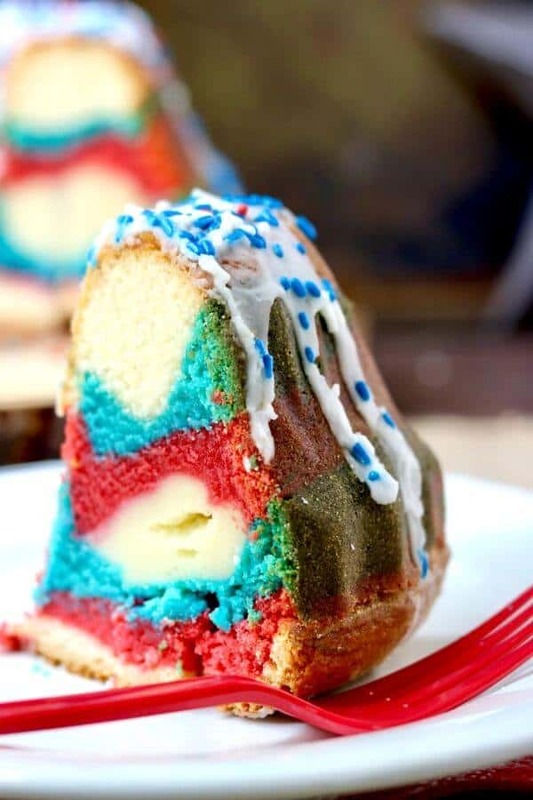 I love Bundt cakes and I’m definitely going to try this fun, patriotic version!!! let me know what you think, Liz! What a fun and festive cake. I love it! That is so cool looking! I am not much of a baker but I’ll have to try this. Love the idea of pop rocks for fireworks…genius! Such a beautiful and festive bundt cake. They are a favorite of mine! Have a wonderful day with your family! You as well! And thanks!